Artist's concept of the Thirty Meter Telescope atop the volcanic peak of Mauna Kea in Hawaii. The construction phase of the TMT project officially kicked off in October 2014; the telescope should achieve “first light” in 2022, if all goes according to plan. 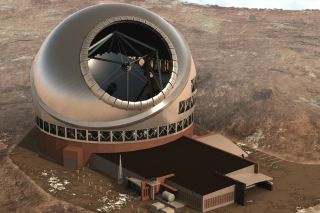 Construction of the $1.4 billion TMT began in October near the top of Mauna Kea, which rises 13,796 feet (4,205 meters) into the sky from the Big Island of Hawaii. The TMT will link up 492 small, hexagonal mirrors to form a giant light-collecting surface 98 feet (30 m) wide. But not everybody is enamored with the TMT. Native Hawaiians regard the peaks of mountains throughout the island chain as sacred, and Mauna Kea may be the most sacred one of all. So building another telescope on this dormant volanco, which already houses a number of observatories, has been controversial from the start. For instance, protestors disrupted the TMT's groundbreaking ceremony in October, and further demonstrations in March and April resulted in a number of arrests and eventually halted construction altogether. In his statement, Yang said TMT representatives are "mindful of those who have concerns, and yet, we hope they will permit us to proceed with this important task while reserving their right to peaceful protest." But another showdown appears to be looming Wednesday. "By proceeding with the project, the TMT officials neglect to acknowledge and act on the concerns of citizens of Hawai'i who have voiced their strong disapproval of the project. This action further demonstrates the lack of respect that the State of Hawai'i and project officials have for Native Hawaiians and their culture, in addition to the health and well-being of the people and the environment," members of the group Idle No More Mauna Kea wrote in a Facebook post Sunday (June 21). "Members of the global Mauna Kea 'Ohana [family] are asked to lift prayers, songs and chants for our mauna [mountain] and those who will be standing physically on the mauna," they added. "Those who are on island and plan to be on the mauna Wednesday morning are asked to bring their highest selves to protect the mauna and stand with compassion, patience, love and forgiveness in their hearts. Bring digital cameras, phones and video cameras to the mauna to document the day as it unfolds."